Coming out of wooden cabins? Walking through thick foliage? WEARING KHAKIS?!?!!!! More pictures of Jake uneasily staring down the picture-taker at the usual spot. Big foot or a big six inches?! 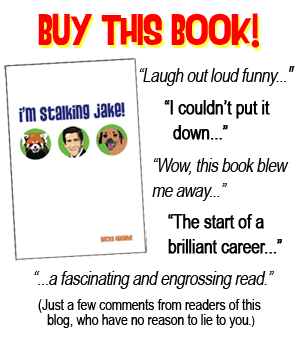 My stalking video will give you renewed strength! Hahahaha! P.S. There is also a new sultry one ***fans herself***! Inspiration works in mysterious ways: I was watching "Sister Act" when I was prompted to make the silly thing! gyllenhaalisgr8: As 'Lil Kim says - "under 7 inches . . EH, sorry!" 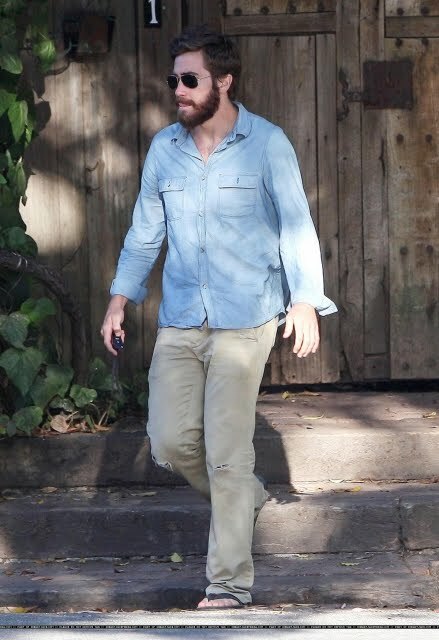 Jeez, aside from the atrocity that defines his beard, what's going on with all that tongue action? It's like his safety blanket. Don't know what face to make for the 'razzi? Stick my tongue out! Walking? Stick my tongue out! Crossing the street! Stick my tongue out. Wow, should have just ditto'd CigarattesAndCoffee's comment. I need to read the comments before I comment. Hey PG - now YOU'RE being quoted as a source (read the comments of this article) HERE! ^^^ NO!! Don't say it. He'll come back. He always does!!! Leslie...I would default to making an exception for Mr. G...and with that tongue he has, we would probably not even notice!! Bubby in flip-flops! I bet he has such cute feet. Is it terrible that I kind of like the khakis? But I definitely do not like the shirt. At all. wow, he looks so tribal, ive never seen him like this!!! Gylls whats going on?? The beard is all the buzz! Yes it's sad isn't it. 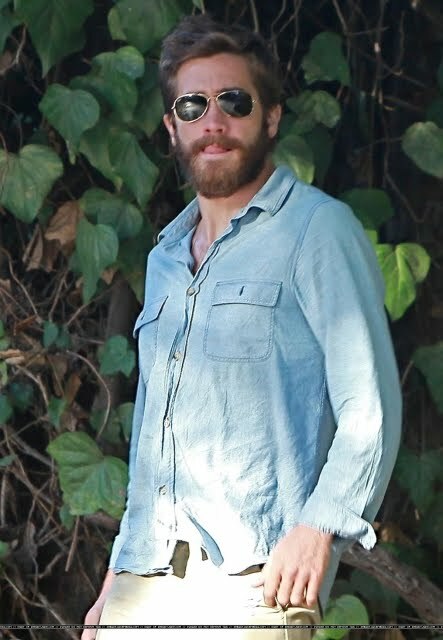 Pattz's beard looks like something pasted on (badly). 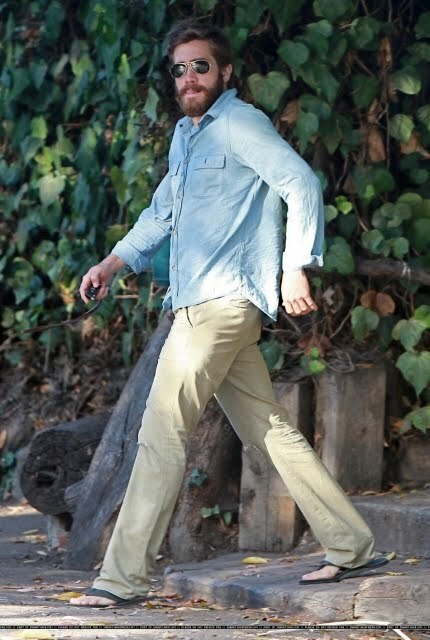 I think people don't even LOOK at the photos anymore, they've all been programmed to automatically click on the name RPattz whenever it appears anywhere for whatever reason. You know, after careful examination of these photos *cough* . . and if I were a betting girl . . I'd have to wager that he's wearing no underwear here. 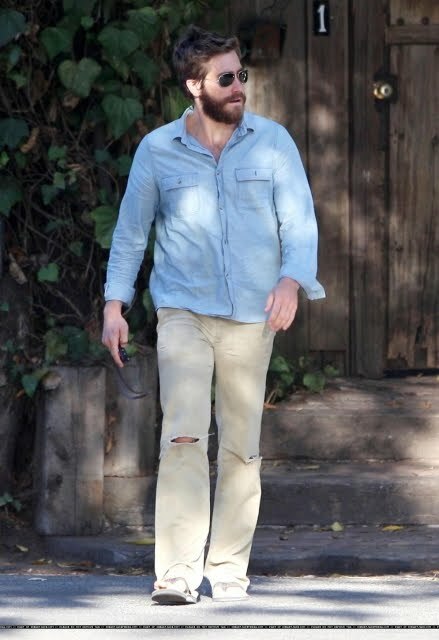 Yes, methinks Sir Gyllenhaal is goin' commando here ladies. Great idea for a debate, Leslie! You know, Vanessa, at this point I wouldn't put anything past him! Is he on a mission or something? 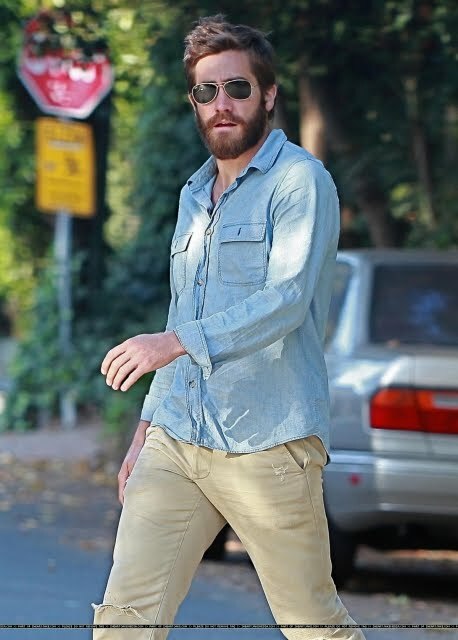 Oh Sir Jake, why hast thou forsaken the Gyllenhaalics of the world? Just because the stupid critics dissed your PoP look isn't a good enough reason to become a Yeti. If you feel you MUST shapeshift, then please make it a werewolf, not Sasquatch, thank you. I'm going for the commando option too. 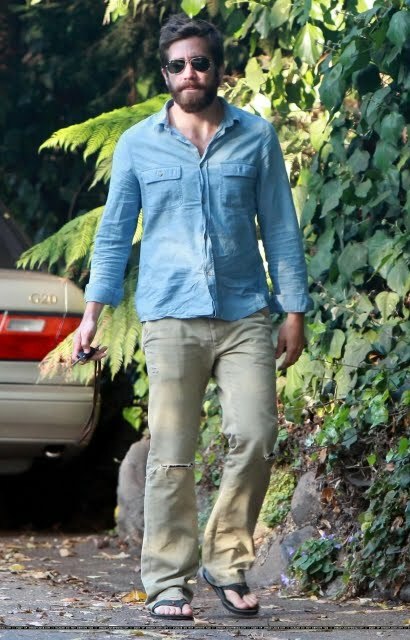 And we already know his friend is Sasquatch (Jimmy Kimmel interview), so he's probably the werewolf. PS: my blog is in Portuguese. Well, the debate is more like . . what do you think he wears? Personally, I think he's got the tight boxers goin' on . . most likely black but sometimes grey or white. Kinda like THESE. Oh, Leslie, you are SO right! 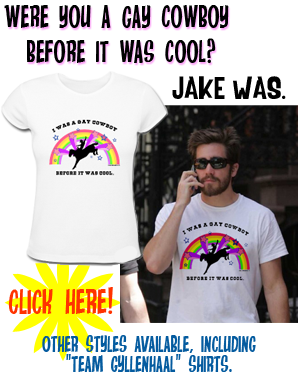 Haha, yes, Jake, PLEASE take it OFF!!! Nathália, I left you a comment on your blog, but I want to say here too that I'm so honored you included me among all those other amazing blogs!! Thanks for recommending me! :D And thanks for reading!!! You mean this one PG? Oh my god, I can't believe I'm posting about this too! Although this is um. Um. Hm. I'll just leave this here. O.M.G. How in the hell am I ever going to be able to keep my mind out of the gutter & on work now??? Thanks a LOT, C&C! Heehee, oh but WHAT a luscious distraction, RIGHT? Well, outdoing the original post wouldn't have been hard this time... :D But I agree that the comments were WAY above average! CAC: Now THAT'S what I was talking about when I said put the Jarhead blu-ray on slow-mo!!!!! Can I say I've already seen this . . in motion . . over a few hundred times??? 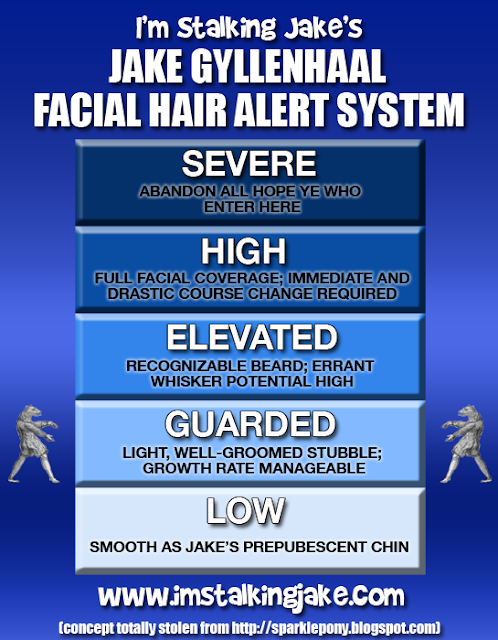 Is that Jarhead picture really Jake? It's hard to see the face??? CigarattesAndCoffee: Thanks for posting my shower pic! Maybe someone is actually visiting my Treasures! S4M985: Even in steam, you cannot mistake the shape of Jake's head (the top one). Vanessa: Thanks for liking big foot! Leslie: I have only seen him [photoed] in Calvin Klein. I'm betting they're tighty-whities, because God knows Jake needs the support! Now I'm going to hide under the bed. P.S. Tell me when you have all seen the crotch montage and maybe I can delete it before Stephen gets wind of it! Oh, what the hell -- he knows I'm totally insane (about his baby boy)! FYI, I have now made 34 Jake YouTube videos (and a couple for Heath)! Did I just say insane? Guilty as charged! C&C: I mean, it's a screen capture, but I take plain Jake photos and work them graphically. I really played with it to see "the main subject" at its best! And I also add text to plain photos to make them more special, more poster-like. PG has my Gyllenhaal Treasures at the sidebar; besides twitpic and flickr, that's their real home! Crotch shotS. Plural. Definitely plural!! PG...I've been thinking a LOT about showing you my X-rated ones. I have never posted them anywhere near the internet, so if I emailed them to you, you would have to delete or eat (let me rephrase that, LOL!). But they are AWE-SOME. Does dad have a penchant for getting inflamed or something? Leslie...it might be paranoia on my part, but I KNOW he's protective of Jake in the public eye. But if you think I'm bad here, I'm worse on twitter, and since he follows my tweets, I'm FUCKED!